A filled-up RV park in Douglas. "Sometimes if [someone] knows they're going to be there long enough they might get you a lease or you might be responsible for getting your own home to our living accommodations so you might have to take it upon yourself to either RV, hotel or do the apartment long term," Short said. The manager at Short's hotel said oil field workers started arriving in droves last October. Other workers came to help with the Steamboat gas plant's construction owned by Meritage Midstream. The plant is between here and Casper. Short said the whole town has become chaotic. "I've been here since September. It's been a lot busier than I anticipated for a town this size," he said. In front of Short is a parking lot confirming just that. It's full of GMC, Ram, and Ford pick-ups each used for services from electricity to gravel. It's the same in downtown Douglas, with trucks filling up Pizza Hut, the Village Inn, and Safeway. Joel Schell, Converse County treasurer, said it's gotten bad. While there aren't statistics to show the population increase, he said address requests are up, RV parks and campgrounds are all full, and even grocery stores are affected. "If the residents of Douglas played it smart, their town could be left in the wake of this oil boom shining like a star instead of being crushed. It can go either way." "I go to Safeway and I'm frustrated because there's no apples. How can you have a grocery store with no apples?" Schell wondered. Five years ago, Converse County produced only 17 percent of the state's oil. But the rise of horizontal drilling and a promise for thousands of new wells has pushed that to a 33 percent share and rising, according to data from the Wyoming Oil and Gas Conservation Commission. That promise for new wells comes from the Converse County oil and gas project which is still working its way through the regulatory process. But even when the Bureau of Land Management released its draft environmental impact statement last April, county commissioners sharply criticized its lack of consideration for housing. Their response pondered why there's no analysis for how a housing shortage would impact cost of living and how an estimate for future demand doesn't look at current availability. The commissions also wrote they worry the lack of housing will force newcomers to illegally camp or negatively impact the value of other residences. Wyoming Business Council's most recent measurement of housing needs in Converse County. 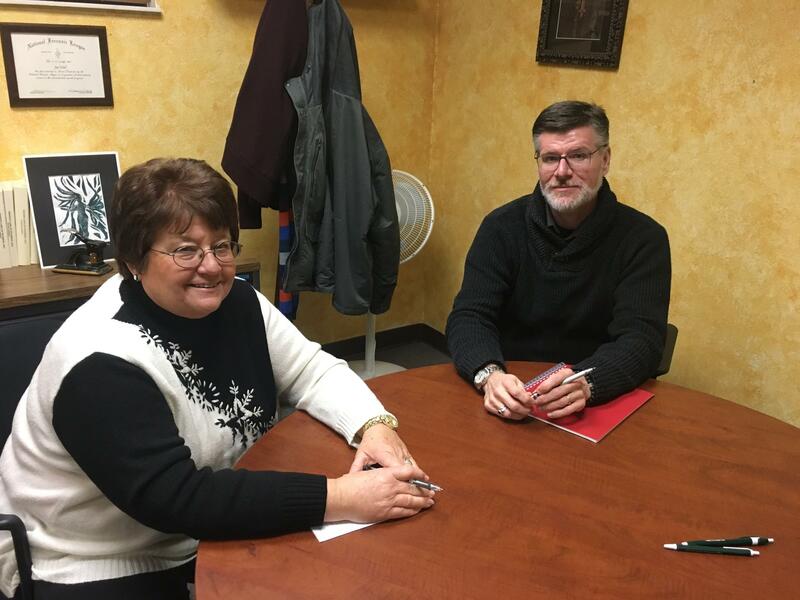 "A more comprehensive discussion would also more fully address changes in housing prices, changes in the future burden of cost of housing as a portion of income and the social effects of housing shortages," Converse County commissioners write. The project is still in its infancy, yet Schell said oil field workers are already filling RV parks, affordable hotels and rentals. "Most of them are staying in Casper because we're full. They wouldn't do that if they could stay here if there was housing available here," Schell said, adding it's a 45-minute commute from Casper. For those who do stay in town, Schell said workers often group together in a place and that can cause prices to shoot up for all other housing. He explained that's what happened during the last boom just a few years ago. "House rentals went from right around $700 a month before the boom to $1,500 during the boom and some of that I think was that per diem where you had workers combining to rent places." The same thing is happening now due to the low supply of housing. 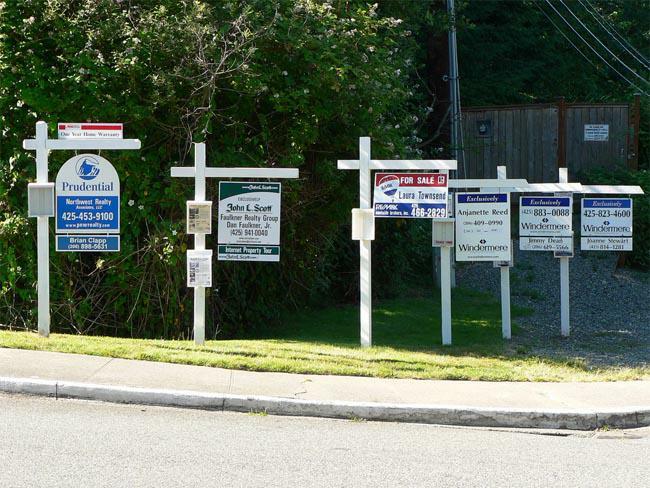 Realtors at several agencies say there's no rental availability in town, with new listings snagged before the day is out. 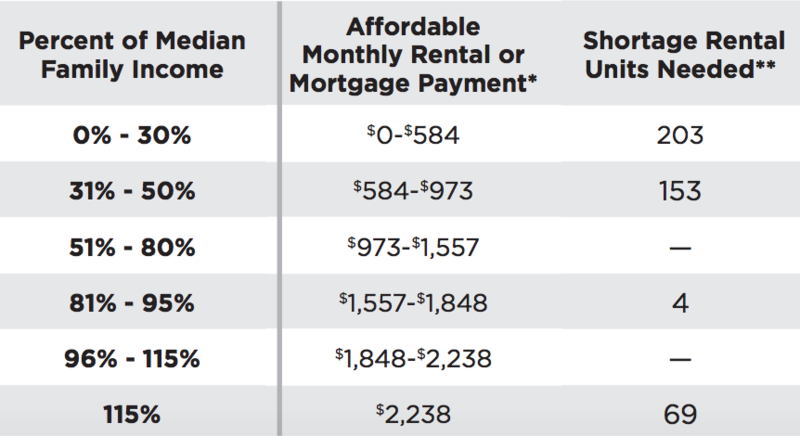 From 2017 to 2018, the average cost of a rental went up nearly 10 percent, according to a report from the Wyoming Business Council (WBC). Schell said it's easy for year-round residents to get priced out. "Some people who were still had nothing really to do with the industry, the energy industry, were still making the same incomes. Got to get priced out of those apartments and had to go find lower and lower and lower," he said. Dane Courville, project manager for SAM Inc. which surveys for possible pipeline routes in northeastern Wyoming, says low housing has his crews staying in Casper. He's had crews around Douglas for a year and a half. Courville recently visited the area. "Everyone's just scrambling to find what they can in the area," he said. Courville said he's aware the toll an oil boom can have on a town, like the pros of adding business to local economy. "There's a lot of riff raff too that comes in. I mean they're a cross-section of society just like any other position," Courville said. But he said residents are not powerless to the boom. Companies often rely on landowner participation and those citizens can ask for more than just a check. Courville said he's seen it happen. "You have no idea how much money is changing hands between a huge ranch and a pipeline company." He said, "I mean, we're talking millions of dollars and for them to just turn over and say hey in addition to that four point two million dollar check you're about to give me. I want you to also give that old folks home downtown $100,000 dollars." 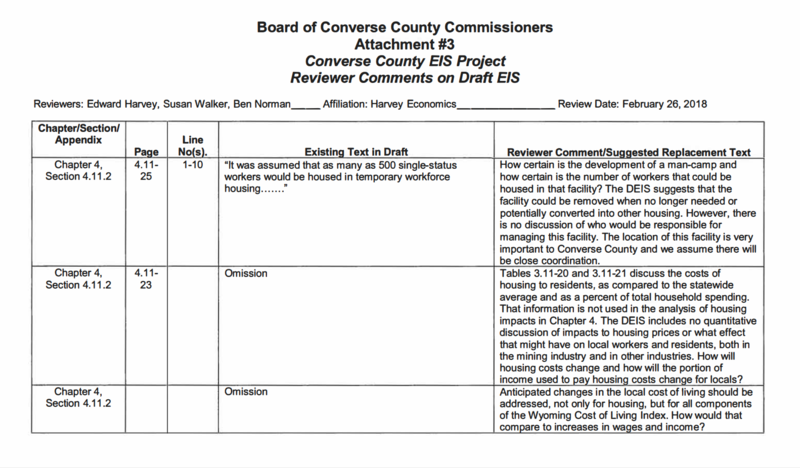 A page from the Converse County Commissioners response to the Converse County draft environmental impact statement that repeatedly mentions housing. Or give to parks or even affordable housing. The same WBC report found there's demand for another 200 units of that sort of housing in Douglas. Courville said it makes sense for landowners to keep the community-at-large in mind. "If the residents of Douglas played it smart, their town could be left in the wake of this oil boom shining like a star instead of being crushed and jails filled, roads crumbling," Courville said. "It can go either way." As far as new housing, construction companies have little incentive to build, knowing the boom will end and people will leave. But for now, the rush to lease and develop new land in Converse County is just starting. There are about just over a thousand active wells in the county right now with thousands more on their way. There's one group that's especially vulnerable to Douglas' limited housing market brought about by the perennial boom and bust cycle. Melodie Edwards has that story.